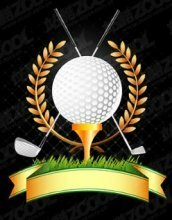 This play golf quiz at gamerisms will test golf players about the lingo, words, and phrases for the Great Green with 10 questions and answers. It is guaranteed to make you the envy of every golf fanatic whether you are a pro like Jack Nicholson, or just enjoy a day at the neighborhood putt-putt course with your six-year-old. 1) What does the golf players' term Fat Shot mean? A. A term used for a long distance golf shot over the water. B. A missed shot where the club head hits the ground before it strikes the golf ball. C. A shot that does not have a chance in the world of making a hole-in-one. 2) What is Frog Hair in golf games? A. Refers to the short grass at the edge of the green. B. A wig for amphibians with severe hair loss or baldness. C. A term called out to warn other players of an incoming golf ball. 3) What does Grasscutter mean in the game of golf? A. Instrument the landscaping uses to trim the green on the course before the players arrive. B. A slang term used for a particular type of golf club. C. Lingo for a powerful shot coming in low. 4) What does the golf players' term Wind Cheater mean? A. A term for someone who brings a wind machine along to throw his opponents’ golf balls off course. B. A golf shot that carries backspin into the wind. C. A really big fan that is used to dry the green on a golf course after a rainstorm. 5) What does the term Feather mean in golf games? A. Something a bird has dropped in a golfer's path of play. B. What all golfers do to their hair before stepping out onto the course. C. Lengthy, air-bound hit that drops gently on the green. 6) What does the golf player's term Medalist refer to? A. Someone who uses a metal detector to search for buried treasure on a golf course. B. Refers to the lowest qualifying score of a tournament player. C. A person who interferes in the concentration of a fellow golfer. 7) What is a Quail High in golf games? A. Refers to a distance shot hit low and flat. B. A place where golf green fowl attend school. C. A type of shot made by hitting a golf ball from the bottom. 8) What does the golf term Skull mean? A. Term for the enamel covering a golf ball. B. A hit above the golf ball center, resulting in a long shot. C. Slang word for a golfer with a shaven head. 9) In golf games, Stony refers to? A. A term for a rookie golfer who continually hits rocks with his golf club. B. An above-average rocky, hilly golf course. C. Golf term for a close hit near the flagstick. 10) What do golf players mean by the term Best Ball? A. Method of play in which any member of the team hits from the best shot. B. Award title earned in a show for golf balls. C. Title given to the golf ball with the longest shot distance. Play Golf Quiz Answers. How did you fare with this golf quiz? 1) B. Fat Shot: a missed shot where the club head hits the ground before it strikes the golf ball. 2) A. Frog Hair: refers to the short grass at the edge of the green. 3) C. Grasscutter: lingo for a powerful shot coming in low. 4) B. Wind Cheater: golf shot that carries backspin into the wind. 5) C. Feather: lengthy, air-bound hit that drops gently on the green. 6) B. Medalist: refers to the lowest qualifying score of a tournament player. 7) A. Quail High: refers to a distance shot hit low and flat. 8) B. Skull: a hit above the golf ball center, resulting in a long shot. 9) C. Stony: golf term for a close hit near the flagstick. 10) A. Best Ball: a method of play in which any member of the team hits from the best shot. Along with Play Golf Quiz, there is a 4 part Golf Games Glossary at gamerisms.